Three-day long celebration of 43rd Foundation Day of Himachal Pradesh University concluded today. In the ceremony, Chief Minister Prem Kumar Dhumal congratulated University authorities for alleviating its ranking to 34th position in the country and laid stress to bring about required reforms to further alleviate the ranking to top position. 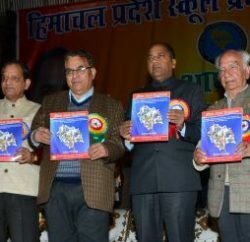 Chief Minister said that Himachal Pradesh ranked at the top in providing highest of 19 percent of its annual budget for Education Sector while the Union Government was spending only 4.85 percent. He said that the State offered best academic and research environment and was capable of attracting students from across the border to undertake higher studies in the clean and fresh environment of the State. He said that education sector had been at the top priority and a number of programmes had been launched to further strengthen the same. He said that the University needed to keep the interest and impression about the University of Common Man in focus before taking any decision and evaluate for itself whether it had been successful in rising to their expectations and aspirations. He said that it was to talk about autonomy to the University but the same would not be possible without shouldering responsibilities which autonomy carry along with it. He said that self dependence was a must to emerge autonomous and the University needed to strive for the same. He expressed deep concern over the practice of some of the teachers not taking classes and the students as well not attending their lectures regularly. He said that it would be in the best interest of the University if services of capable and competent teachers were retained even after their retirement which would go a long way in maintaining the standard of education. He also advised to consider opening a separate Department of Philosophy in the University. Chief Minister said that the State Government would extend all help to the University in expanding its campus further for adding more departments as the State Government had been providing grant to it every year and Rs. 81 crore had been provided recently. Chief Minister also released a large number of publications, monograms, CDs and magazines brought out by different departments of the University. Chief Minister also inaugurated four storeyed buildings of Phase-1 multi faculty Block constructed a cost of Rs. 2.08 crore, UIIT and Computer Sciences Phase-I and II constructed at a cost of Rs. 2.66 crore and Academic Block of Pre-Examination Coaching Centre for SC/ST/OBC/Minorities students, Phase-I constructed at a cost of Rs. 1.19 crore in H.P. University, Shimla. 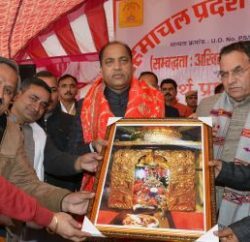 Suresh Bhardwaj, local MLA, said that the University had come a long way since its inception and he happened to be the student of first batch of the University. 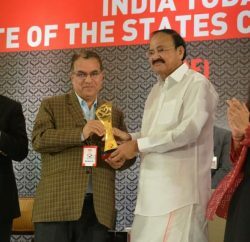 He said that the standard and reputation of the University had improved considerably with every passing year and now it ranked among the top universities of the country. He thanked Chief Minister for his liberal financial grants to the University to manage its affairs. Dr. ADN Vajpayee, Vice Chancellor, welcomed the Chief Minister and other dignitaries and said that a number of new schemes had been launched to match the global standards in higher education. He said that the University was actively considering creating a corpus of Rs. 200 crore to finance various schemes and activities of the University. Dr. Ved Pratap Vedic, Dr. H.S.Banyal, Dean of Studies, C.P.Verma, Registrar, Dr. Arun Sharma, DC, C.S Pandit, SP, teaching faculty, prominent participants of the celebration and teaching and non-teaching faculty were present on the occasion.